Artemis Bridge is a man with connections. He’s the guy who knows a guy and he sells his connections to those that have a need and the cash. He’s an ex hacker turned legitimate business man (there’s nothing illegal about introducing two people). He operates in the grey market unwilling to get his hands dirty. He thinks fast and talks fast, but when he’s given a damaging video that puts him in the cross hairs of the most powerful men in the city very few of his connections are willing to help him. Bridge must get his hands dirty; doing things he swore never to do again, and in the process he learns who his real friends are, who he really is, and who really runs Los Angeles. 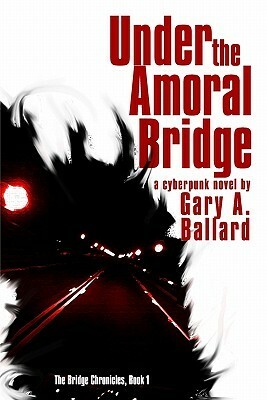 The first thing you’ll notice about Under the Amoral Bridge is the concise and witty language that’s used to develop the character of Artemis Bridge which serves to deliver a clear vision of the characters motivations and world view. The clever writing is not just in narration or internal dialogue, but the banter between characters is some of the more subtly humorous and engaging writing that I’ve read in a while. The novel is fairly short and a quick read, I believe it’s the product of a serialization. If I’m forced to stop praising the succinct writing my only negative comment would be with the ending of the novel which seemed a bit muddled and rushed with the resolution delivered in the last chapter. Which I don’t dislike for any kind of literary principal, it’s just in this case the ‘facts’ were vaguely defined. Even the revelation of the facts were delivered a little too easily making it a little too unbelievable as they were simply told to Bridge by someone that spent the entire novel trying to keep Bridge from finding out too much. But in the end the ending didn’t live up to expectations because the novel succeeded so well in telling an awesome story.